summer is slowly coming to an end and so is this years festival season. Me and Olivia were lucky enough to see the band at their headline show this summer, Community Festival. It was a day full of fun, sun and great music. It was also the first time I met Olivia. After over a year working on this site together we finally got the chance to meet in person and enjoy the day together. We met up early and then made our way to the main stage where we were lucky enough to get to the front! The line up included a nice mixture of rock, punk and indie music including previous Two Door tour opening acts like Sundara Karma & Circa Waves. It also featured the Vaccines, You Me at Six, Rat Boy, Marmozets and basque band Belako. Eveyrthing had a good pace to it with the bands sometimes playing up to an hour and then a short break in between. The whole gig felt like a celebration of them and all their success as a band as they played through songs from Tourist History, Beacon and Gameshow. I want to say a big thank you to all the organizers of Community and the security staff who took care of us front rowers all day by providing us with plenty of water. I would also love to give a shoutout to the lovely girl and her mom standing left of us for sharing some food. 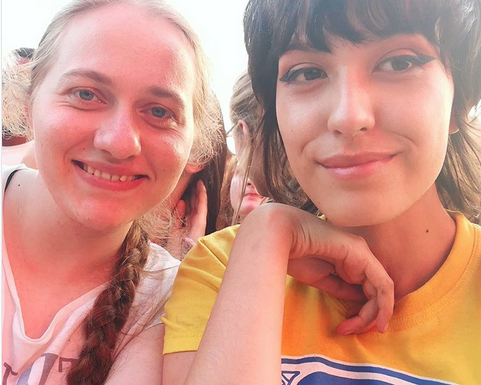 It was so lovely to meet some of you basement people, even more lovely to finally meet and spend the day with you Olivia, and the absolute best to watch Two Door perform. Were you there ? Let me know your story on Twitter! Have a good day basement people! This entry was posted in Site News on August 13, 2018 by Maybrit.